For many of Europe’s fastest-growing businesses, their ability to invest in new technology and implement it effectively will be the defining factor in their success in the years to come. That imperative is becoming steadily more important: 26% of businesses in the sector say that investment in technology was among the most important factors in the growth they have achieved over the last three years, but 54% expect it be a vital driver of growth in future. The shape and intent of technology investment also looks set to shift in the years ahead. For example, 49% of fast-growing energy companies say internal processes have benefitted most from technology investment, in areas such as the supply chain and operations. This is not surprising: technology can boost efficiency and productivity, lower costs and improve margins. Similarly, gas, oil and coal plants are looking to improve their fuel optimisation and produce the right mix of fuels with the right grades, while many are turning to technology to analyse emissions. Technology can, for example, help manage maintenance timeframes and redirect power flow or generation during outages. While technology may have reaped the greatest rewards in internal processes, only 22% of fast-growing energy companies say the same about customer experience – for now. Fast forward to the next three years and many have fresh priorities: 31% plan to prioritise technology investment that will help them understand and enhance the customer experience, up from 12% over the previous three years. Cloud computing is set to be a priority for more than half the businesses in this survey (55%), providing a means for them to scale up with agility and speed, particularly with the use of “as-a-service” tools (i.e. delivered as a service via cloud or a network) that can boost or reduce capacity at a moment’s notice. Big data and analytics are set for investment, with more than a third (35%) of fast-growing energy businesses focused on this area. This may be key to better understanding customer needs and requirements – for example, by providing actionable insight that will enable energy companies to focus on improving the experience. But the data revolution also offers energy companies huge opportunities to operate more effectively. Automation will also be a key focus for 47% of businesses, exploiting both internal tools to reduce manual processing and improve quality and productivity, and investing in market-facing areas. “Automation is an effective tool that will work its way through the electricity supply chain,” says the managing director of a UK-based energy company. 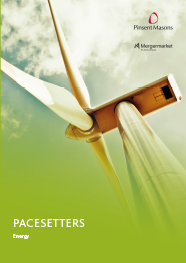 Many fast-growing energy businesses are so focused on adding to their technology capabilities that this is now the focus of much of their M&A strategy. For example, almost half the respondents in this research (48%) say technology providers would be the main targets of interest for oil and gas majors and utility firms that are looking to enter the renewable energy market. Almost half the businesses in this research (46%) say investment in battery storage is going to be crucial over the next three years, a massive leap on the 3% who have focused on this area over the past three years. In the past, if power was generated and wasn’t used, it dissipated. Now, innovative businesses are working on efficient commercial-scale battery storage projects to store excess energy during periods of low demand and provide commercial-scale battery storage at or near the source of demand. However, it remains to be seen whether these projects are economically viable, and there are always risks when investing in new technology. Storage is seen as a “holy grail” in renewable energy, but may require government subsidies similar to those in the early days of solar power. Europe’s fastest-growing energy companies now see battery storage as such crucial technology – and therefore a growth driver – that they are focusing on this area to the exclusion of many previous priorities, including smart meters, cloud-based management and power-to-X technology.